The big news here last week was that we are to have a referendum on the European Fiscal Stability Treaty. Which will be about as exciting as watching paint dry. I bet you're really looking forward to the debate, just like me. Will the Irish people vote yes? Will they vote no? Will it make any difference? We'll be torturing ourselves with this stuff for the next couple of months. So before it gets too impenetrable and soporific, here's your easy-to-follow guide to what it's all about. Why does Europe need a new fiscal treaty anyway? Mainly it's to reassure the Germans that the money they are pouring into bailing out bankrupt Eurozone countries like Greece, Ireland, Italy, Portugal and Spain won't vanish down the plughole with nothing to show for it. It's all about saving the Eurozone and the euro as a currency. What does the treaty do? It ties the states in the Eurozone to financial rectitude in the future. Gone will be the days when politicians held on to power by promising voters all kinds of goodies and then borrowing huge amounts to pay for them. Irish politicians wrote the book on this -- they've been at it for years. Which is why we now have a massive welfare state here that we can't afford and a resulting massive budget deficit that has to be bridged by an EU-IMF bailout because no one else will lend to us. In future, Eurozone states will have to stick to a structural deficit of 0.5% of GDP -- the structural bit means that the calculation allows for the ups and downs of economic cycles. Or to put it simply, Eurozone states will effectively have to run balanced budgets. If states can't raise the taxes, they don't spend the money. Which will be a major shock for Irish politicians. What about overall debt? The treaty will mean that states will have to get their national debt down to the already agreed level of 60% of GDP. Before Ireland is out of this crisis we'll be around twice that level, so it will be years before we get there. But we have to commit to working towards the target. Mind you, unless we want to see vast amounts of our revenue being spent on interest for decades to come, this is what we need to do anyway. So if the treaty makes sense, why is it so controversial? That's because it's going to mean severe austerity here while we get our financial house in order. But aren't we already suffering severe austerity? You're right there. It's cutbacks everywhere here at the moment, and that's going to continue for at least another three or four years. So this treaty won't actually make much difference to us? Right again. The EU-IMF bailout program we are in commits us to getting our budget down to 3% by 2015. Our budget deficit will be close to zero about five or six years from now. It's the only way we're going to be able to get back into the financial markets so we can borrow for genuinely productive investment instead of day-to-day spending. In the meantime we are going to have to cut state spending with a series of austerity budgets the like of which have never been experienced here before. Is there anyway to avoid this? Sorry, not a chance. We're caught. We have to stick with the program to get the bailout money for the next few years until we can balance our budget. Otherwise it would be financial cold turkey instantly, which could cause a total breakdown of society here. 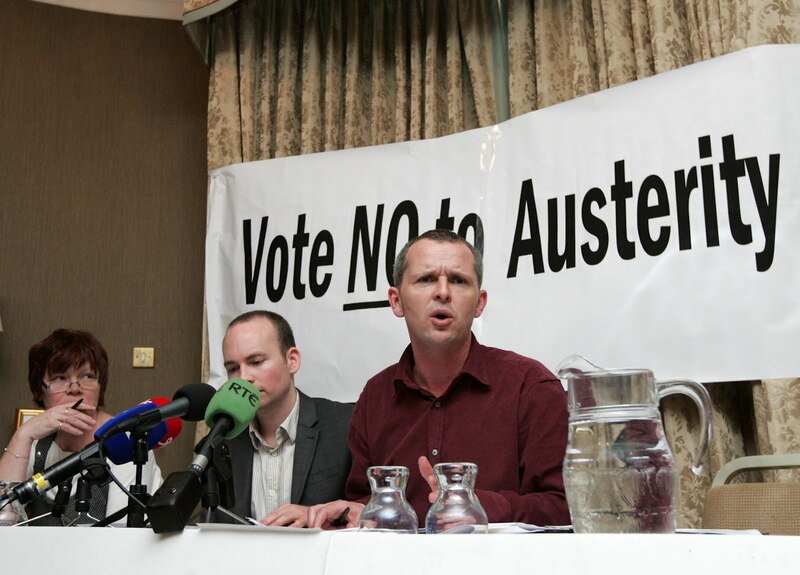 So since we have to go through austerity anyway, should we all vote yes in the referendum? Well, it's not as simple as that. There are arguments in both directions. For a start, there's the possibility (however remote) that the EU/IMF would turn off the bailout tap. A bigger problem is that only states that sign up to the treaty will have access to the new European Stability Mechanism (the ESM), a massive permanent bailout fund set up to help Eurozone states in trouble; if we need a second bailout (and the ratings agency Moody's on Monday predicted that we will) then not having access to the ESM would be a disaster. All of which points to a yes vote. But there are also reasons why a no vote makes sense. For a start, this whole process we are in is a disgrace. Part of the blame for the Irish financial crisis goes right back to the way the Eurozone was set up and the failure to complete the kind of fiscal structures that would have made the whole thing work. Right through the boom here, when we should have been raising interest rates to calm things down, we were tied to the lower interest rates that suited Germany and so were imposed on the rest of Europe. Then there's the culpability of the German and French banks that took a gamble on the Irish property boom by lending billions to the Irish banks and now want all their money back even though the property deals have collapsed -- and the EU and the ECB have made it a condition of us getting the bailout that none of our banks defaults on its debts to these bondholders. As you may know, most of these bank bondholders, foolishly guaranteed by the Irish state in the autumn of 2008, have now been paid. But to do so the Irish state has had to borrow billions and billions, and that debt is now being carried by the Irish taxpayer. A big chunk of what we get in bailout funds goes right back again in debt repayments. It's absolutely crazy when you think about it. It's also unfair and unjust. Why should the Irish taxpayer have to carry this enormous burden? You can't get a straight answer from anyone in Europe because there isn't one. What this referendum does is give the Irish voter the chance to protest against this terrible injustice. An example of the injustice is the situation with the former Anglo Irish Bank, the small bank that became a big player by stoking the property boom here, acting illegally and recklessly, and was one of the main reasons the country is now bust. The bank is now closed down, but the ECB is making us pay back all the money owed to its unguaranteed bondholders. This has become a big issue here, with around €30 billion in promissory notes (IOUs signed by the government) involved. We are due to pay this back at the rate of just over €3 billion a year for the next 10 years (and coincidentally €3 billion is roughly equivalent to the amount of painful cutbacks we have had to make here this year). We are also paying a penal rate of interest on this debt (up to 8%), even though hundreds of billions in new money is now being pumped into banks across Europe by the ECB at a rate of around 1%. This is so outrageous that it's beyond comment. One government minister here broke ranks last week and suggested that we should let Europe know that unless we get a deal on the €30 billion in promissory notes the Irish people are likely to vote no, no matter what the consequences. That deal should include a big interest rate cut and/or a big capital write down. All of which is a strong reason for voting no. So far the Irish government are still being the good boys in Europe. Taoiseach (Prime Minister) Enda Kenny has said that the two issues (the treaty and the promissory notes) must not be linked. He says that the votes of the Irish people "cannot be bought" and that separate negotiations are taking place with the ECB about the promissory notes. He's either a fool or else he's smarter than we think and he's playing a subtle game with Europe. So what's likely to happen? It's too early to say. An opinion poll last week showed that more people here are inclined to vote yes, but there is a very big number of people who have yet to decide. If they don't see the EU playing fair and offering Ireland a deal in the coming weeks, they may well vote no in a couple of months when the referendum is held. Does Europe care or will they just let us swing in the wind? Of course they care. Any state falling out of the Eurozone will put the whole European integration project at risk. Look at the lengths they have gone to in a probably futile attempt to keep Greece in the Eurozone. They are even more desperate to keep Ireland in, which is why they altered the wording of the treaty a few weeks back in an attempt to avoid the necessity for a referendum here. What happened 10 days ago was that the attorney general advised the government that a referendum was necessary anyway, because the proposed changes had a constitutional impact (we seem to be the only country in Europe where something like this cannot be implemented without a referendum). There was some surprise at this, but in reality any attempt to introduce the treaty here without a referendum would have been challenged in the Supreme Court. So a referendum it is. Which means we have our European masters by the liathroidi. That's Irish for balls, in case you didn't know.